Today I’m very happy to welcome Chris Russell, author of the Songs About A Girl trilogy to the blog with an exclusive reading from the final book in the trilogy, Songs About A Boy. I had the pleasure of reading Songs About A Boy recently and LOVED it, but I am sad to have to say goodbye to the wonderful characters who I’ve fallen in love with over the course of the trilogy. It’s been a joy to read each book, and I’ve come to know and love Chris’ painful (but in a good way) cliffhangers, the friendships and complicated relationships between his characters, and the exciting world of his fictional band, Fire&Lights. I hope you enjoy this exclusive reading of Songs About A Boy! 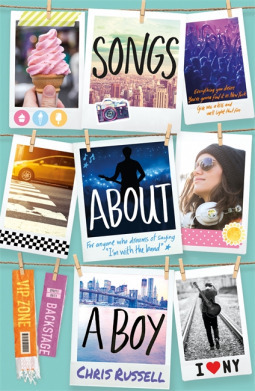 Music, boy bands, first love and heartbreak in the explosive finale to the Songs About A Girl trilogy – a modern love story for anyone who has ever dreamed of being ‘with the band’. From a Zoella Book Club friend. Just as Charlie allows herself to succumb to Gabe’s charms, the explosive revelation about her mother’s death threatens to pull them apart. Meanwhile, a media circus has exploded around the future of Fire&Lights – when they announce a US tour to show the world that they are stronger than ever, Charlie gets the opportunity to accompany them. New York City, here she comes! But it’s not all fun and games. Charlie is still feeling all kinds of awkward around Gabe and knowing that her mother’s last days were in America touring with her band, Charlie uses the opportunity to uncover some more truths about her mother’s death. Have you read Songs About A Girl, Songs About Us or Songs About A Boy?